REPLICOR’S NEW PHASE II TRIAL CONDUCTED BY CLINICAL ACCELERATOR PRODUCES EXCITING CLINICAL DATA FOR THEIR NUCLEIC ACID POLYMER (NAP) DRUG REP 2139-CA FOR PATIENTS WITH HBV / HDV CO-INFECTION. In December last year a Clinical Accelerator post (1) reported that recruitment was underway in Moldova for an interesting Phase II trial of Replicor’s novel nucleic acid polymer (NAP), REP 2139-Ca, in combination with the immunotherapeutic agent, pegylated interferon alfa-2a (Pegasys™), for Hepatitis B and D virus co-infection (HBV + HDV) – the most aggressive form of hepatitis (2). In its late breaking presentation at the recent 2015 European Association for the Study of the Liver meeting (EASL) in Vienna, Replicor Inc. was able to disclose some exciting safety and efficacy data, which have emerged from a planned interim analysis of this REP 301 trial after timely completion and analysis of the first monotherapeutic phase. The trial of 12 Caucasian patients with chronic HBV / HDV co-infection is examining safety and efficacy of 15 weeks of monotherapy with REP 2139-Ca, followed by 15 weeks of combination therapy with REP 2139-Ca and Pegasys™ and then a further 33 weeks of consolidation therapy with Pegasys™ alone. These first data, primarily from patients on monotherapy, have demonstrated that REP 2139-Ca was well tolerated and, interestingly, resulted in the rapid and simultaneous multi-log reduction of both serum HBsAg (hepatitis B surface antigen) and HDV RNA. Many patients had no detectable serum HBsAg or HDV RNA after the 15 weeks of monotherapy, even before entering the current 15 week combination therapy phase of the trial. The reduction or elimination of HBV and HDV from the blood was accompanied by the appearance of signifcant titers of anti-HBsAg antibodies. 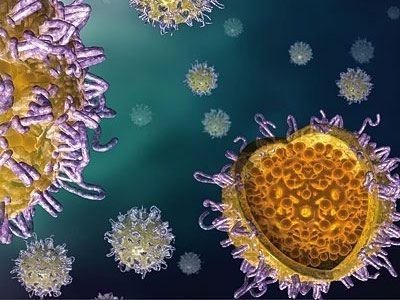 The hepatitis D virus can propagate only in the presence of HBV as HBsAg is an essential component of the hepatitis D virus, thus clearance of HBsAg is key to restoring the host’s own immunological control of HBV infection and HDV infeciton. A synergistic effect with Pegasys®, in the second phase is also expected to have a significant antiviral effect against HDV infection. These are important new clinical data, which validate the ability of NAPs to clear HBsAg from the blood rapidly at a second trial site and in a new ethnic patient population, demonstrating the universally reliable effect of NAPs to clear serum HBsAg in all patients. In previous Asian clinical trials, the removal of serum HBsAg by REP 2139-Ca in patients with chronic HBV allowed a significant improvement in the achievement of a sustained virological response by immunotherapy compared to that normally observed with immunotherapy alone. Future data from the ongoing REP 301 trial will be monitored to assess whether there is a similar outcome for patients with chronic HBV / HDV co-infection. None of the currently marketed antiviral agents for HBV, whether used alone or in combination, has the ability to treat this co-infection. Hence there is an urgent and unmet need for therapies to treat infection with hepatitis D and B viruses. Clinical Accelerator are pleased to be collaborating with Replicor with Dr Victor Pantea and his diligent team at the Hospital for Infectious Diseases “Toma Ciorba” in Chisinau, Moldova and look forward to delivering further good quality data from the remaining phases of the study. We also wish Replicor every success with ground-breaking work aimed at realising their quest to revolutionise the treatment of viral disease. Clinical Accelerator starts recruiting for early Phase Hepatitis B / Hepatitis D trial in Moldova. Posted on December 1 2014.